First, let’s all take a quick moment to congratulate the Association. The reality is that just about four months ago, the norm in terms of NBA conversation was how the dominance of Golden State had made for an uninteresting league; the lack of parity during this past playoff run could potentially been seen for another entire season to come. Ironically, this current off season has been more intriguing then many in recent history- mostly due to “off court” headlines. Without mentioning LaVar Ball (opps I just did it again) – well there was that never-ending verbal nonsense which contributed to one of the most highly attended NBA Summer Leagues – I was there- it was fantastic. Record breaking and somewhat sickening contacts like Steph Curry’s (5 years, $201 million) and James Harden’s (6 years, $228 million) got us all chatting and debating. However, things really started heating up with movements of mega talents like Paul George, Chris Paul, Derrick Rose and Gordon Hayward. However, the biggest off season shaker occurred when it came to public light that Kyrie Irving made it clear that he wanted out. I immediately went back to the 2016 Eastern Conference Finals, when I had the opportunity to be a part of the NBA on ESPN crew for Game 6 in Toronto. 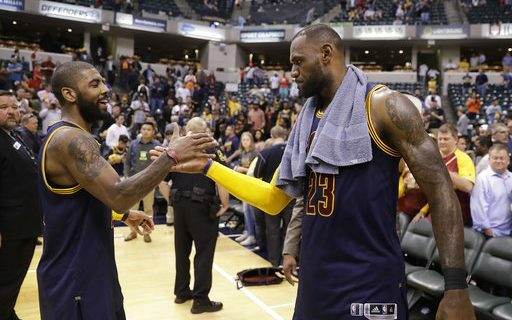 The Cavs clinched the series that night and stamped their ticket to the Finals. I had a deep respect for the talent on Cleveland’s roster – but it was on this night that I became a fan. The TV crew was wrapping and tearing down- it was close to 1 am-and the Cavs’ bus was parked and ready. Yet in the back hallway of the Air Canada Centre sat the likes of LeBron, JR Smith, and Kyrie amongst other teammates. They were just hanging out, passing around the ECF trophy, relaxed and laughing. They actually liked each other. You could really feel a sense of cohesion – in my mind it was no coincidence that the upcoming Finals turned into one of the greatest comebacks in pro sports championship series history- in favor of this group of men who really seemed like a team. Now fast forward a season that concluded with a disastrous showing at the much anticipated Cavs/Warriors NBA Finals rematch. Something tells me there were no hallway ‘post game chillaxing sessions’. It was downright embarrassing. Golden State manhandled Cleveland on the biggest stage in the world. Yes- something had to change and it wasn’t going to wait an entire season until the King gets to relocate, or not. Despite how friendly this group seemed, make no mistake- something had to change. I for one, am ecstatic about the Irving/Thomas trade. The big question right now is of course, who got the upper hand on this deal? Come on now- this will be determined at later date. Although I have Oct 17th circled (they open the regular season at Quicken Loans ). It is too early to say for certain which stud is going to have a greater impact within their new organization. Thomas (assuming he is healthy and ready to go) joins a star-studded roster that returns its core and also adds Rose. It can be confidently said that Thomas’ role will change. Anyone who plays alongside LeBron has to know they drop in terms of option of the offensive end – it’s life in the presence of a King. That being said- Thomas has never struck me as a guy who needs the spotlight. We all saw the way his team uplifted him during the horrendous tragedy in the midst of last season’s playoffs when his younger sister was killed in a car accident. This alone showed that the guys care for him- genuine relationships that one can assume, he will be more then willing to build as a Cav. Kyrie seems to have jumped into Boston with the opportunity to take over right away. Having a dynamic guard like Irving surrounded by fantastic bigs, including newly acquired Hayward, Al Horford and rookie Jayson Tatum (my favorite 2017 draftee) absolutely excites a ball junkie like myself. Yes- Irving made it known that he wanted to go somewhere that would allow him to be more of a franchise face-aka out of Lebron’s shadow. Boston’s current roster allows him to do that. The Celtics have some phenomenal talent and if you combine that with the exquisite leadership in Brad Stevens we may just a Eastern Conference contender. Again- the NBA as a whole has to be feeling pretty proud right now. This off season was exactly just what the rating’s doctor ordered. Now can we get the season started already? !